Every nonprofit organization and nonprofit cause or mission that relies on federal regulation, executive orders, or other non-legislative approaches to implementation is at risk of profound change or elimination when Donald Trump takes office in January. Instead, using President Obama’s 2014 declaration that “I’ve got a pen and I’ve got a phone,” a record number of executive actions, agency rules, and department “guidance” has shaped federal policy, often in controversial and significant ways. Interestingly, relatively few of these initiatives were implemented using the formal “executive order”—only 256 executive orders have been issued under the Obama presidency through October 20, 2016. In comparison, Ronald Reagan issued 381, Bill Clinton issued 364, and George W. Bush issued 291 executive orders. The reliance on regulations led to more than 81,000 pages in the Federal Register, the official daily digest of the national government, in 2015, eclipsing the 77,000 pages in 2014 and the previous record of 81,405 set in 2010. 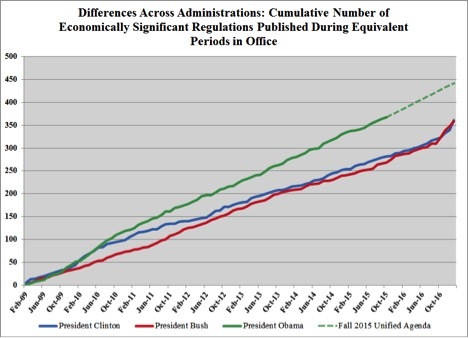 When “economically significant” regulations are considered, Obama’s totals significantly exceed those of Bill Clinton and George W. Bush. The difficulty with non-legislative approaches to advancing an agenda is that while a president doesn’t need Congress to enact regulations and administrative guidance, he or she doesn’t need Congress to amend or repeal them, either. More importantly, each succeeding president may amend or repeal a previous president’s actions. In addition, new Cabinet secretaries may change or eliminate administrative regulations or “guidance” issued by their predecessors. When President Obama met with President-elect Trump at the White House last Thursday, Obama was expected to make a pitch for Trump to keep at least some of his executive actions intact. Section 212(f) of the Immigration and Nationality Act says, “Whenever the president finds that the entry of any aliens or of any class of aliens into the United States would be detrimental to the interests of the United States” the president can keep them out for “such period as he shall deem necessary.” Trump seems to have backed away from campaign proposals to ban all Muslims from entering the U.S. until secure vetting procedures are in place, but any president has the authority under existing law to make a finding affecting legal immigration. What we are going to do is get the people that are criminal and have criminal records, gang members, drug dealers, where a lot of these people, probably two million, it could be even three million, we are getting them out of our country or we are going to incarcerate. But we’re getting them out of our country, they’re here illegally. LGBT Rights—There are a variety of executive actions that expanded LGBT rights under the Obama administration, including protections against discrimination in housing and health care, as well as barring discrimination by federal contractors in their dealings with LGBT employees. In 2014, the U.S. Department of Education issued new “guidance” interpreting Title IX of the Civil Rights Act as prohibiting discrimination against transgender students by forcing them to identify based on their biological gender rather than their personal gender identity. For-profit Colleges—Trump has already signaled support for ending administrative rules that make it more difficult for for-profit colleges to attract students relying on federal student loan support. Climate Change and Energy—The UN Paris Climate accord, which Obama ratified on behalf of the U.S. in September, could be dead on arrival in a Trump administration. Although the accord’s provisions call for a three-year process for a signatory nation to withdraw, President Trump has the option to simply not implement the accord’s provision. The U.S. Army Corps of Engineers will likely be directed to complete construction on the last section of Dakota Access oil pipeline beneath the Missouri River at Lake Oahe near the Standing Rock Sioux Reservation. It is also likely that the far larger Keystone XL pipeline project will receive more favorable administrative treatment. The EPA regulations involving the use of coal in electricity generation, referred to as “the war on coal” by detractors, will be vulnerable as well. Healthcare—Complete repeal of the Affordable Care Act (ACA, or Obamacare) will require legislative action. However, Trump administration officials could immediately decide against efforts to support private insurance companies and state-based nonprofit health insurance cooperatives. Insufficient premiums and higher than expected claims have resulted in losses far greater than expected, and a “risk corridor” funding system in the law has been far from adequate to make up the shortfall. Medicaid expansion could be materially affected through administrative changes in interpretation of waiver applications and state-based Medicaid practices, especially in states than elected not to expand Medicaid under the ACA. Trade—The pending Trans-Pacific Partnership (TPP) agreement will not be approved in its present form. Trump has proposed amending or rescinding NAFTA, which was approved in the 1990s. He has also said he’ll direct the Secretary of the Treasury to declare China a currency manipulator and implement excise taxes on Chinese-made goods to counteract the effects of alleged manipulation. An excise tax of 45 percent has been widely quoted, based on an example Trump made of what level of currency manipulation may be determined to be present. Foreign Policy—Recent normalization of relations with Cuba could be in jeopardy, potentially jeopardizing future initiatives like the 2015 foundation grant to preserve a Hemingway residence. The Iran nuclear deal is just that—a deal, not a Senate-ratified treaty, so Trump is able to demand renegotiation or decide to cancel the agreement and reinstitute economic sanctions. However, doing so may upset American Jews, who overwhelmingly expressed support for the agreement. There are risks in some or all of these potential executive actions the incoming Trump administration is poised to perform or is at least contemplating. Many people, including nonprofit leaders, are unaware of how many perceived changes in law over the past several years were not, in fact, changes in law, but rather changes in far more vulnerable administrative rules. The plea for continuity between administrations is reminiscent of the constitutional principle of stare decisis, which encourages new legal decisions to be interpreted in the context of previous legal decisions, thereby promoting a gradual change in specific laws that is more likely to build respect for and obedience to the law in general. 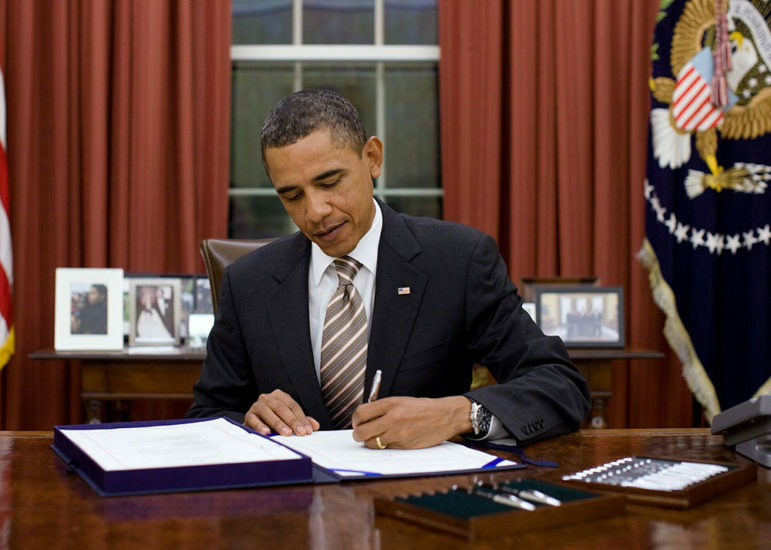 The dilemma with governing by executive action is not only that people dissatisfied with the executive actions can sue, but also that they can delay action to comply and wait for the next administration to make desired changes, meaning that executive actions and administrative rules lose the respect they might have had were they more judiciously created and/or rescinded. 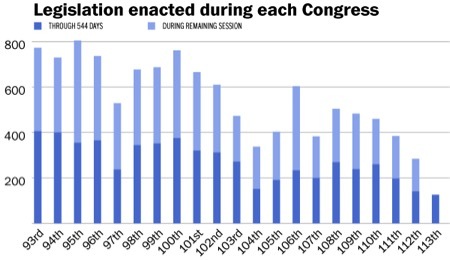 The nation is learning that government by executive action, not supported by legislative approval, is as tentative as the electorate and as fleeting as each successive administration deems it should be. This almost overwhelming thought should serve as a call to carefully considered action. After days of pressure from citizens, lawmakers, and the media, President Trump signed an executive order to stop the separation of children and families at the border. However, it’s not quite time to celebrate.